One of the recurring themes of any sale is getting the customer to focus less on the initial price of a system, and more on the savings the technology will generate over the course of time. How challenging this is depends on both the client and the market in which they are operating, but an increasing number of public and private organizations are acknowledging that a significant up-front investment can contribute to boosting efficiencies—and therefore, decrease expenses—in a big way. This has led to increased use of videoconferencing and video arraignment technologies, noted Ron Camden, vice president of North American sales at Biamp. “Courts used to spend a lot of money transporting a prisoner from a jail to a courtroom, and now that you can do that with video arraignment, you can save a tremendous amount of money,” he said. 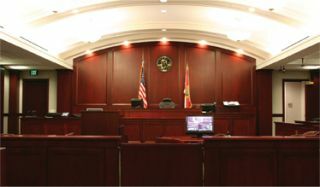 A standard courtroom feature has been sound masking, and as the years have passed, noted Steve Young, vice president of sales and marketing at Atlas Sound, the technology has improved significantly. “There are better equalization settings, more zone outputs, and more feature options in general for courtroom applications,” he said. He pointed out that the Atlas ASP-MG24, for example, offers zone outputs for up to four dedicated, independent zones of sound masking, as well as auxiliary inputs that enable the same loudspeaker to be used for sound masking as well as public address. Up to 30 different pre-sets can be programmed into the system to accommodate for the attendance level in the courtroom on any given day. Smith Audio Visual implemented its Premium TouchDigital networkable digital recording system with AMX touchscreen control into 25 courtroom and hearing rooms for the Johnson County District Courts in Olathe, KS. With 1TouchDigital, all audio files are pushed off to the server automatically, so transcriptions can be easily done via any PC. and the recorder can be expanded to 24- channel recorder from the start,” he said. Each audio input can be recorded separately, and the interface was designed with flexibility in mind, enabling, Heilman explained, easy integration with existing sound reinforcement systems. The standard 1TouchDigital includes an eightchannel recorder and audio interface, while the Premium model features a seven-inch AMX touch screen offering one-touch start and recording as well as control over the whole room, enabling judges to mute any input, control volume, activate noise masking in the jury box and interface with videoconferencing functions. In addition to the emphasis on more channels, Camden indicated that recording is now becoming centralized on a network. “It’s more cost effective to have a group of people that are monitoring the recording that is taking place in a number of courtrooms,” he said. Young noted that the Atlas Varizone enables centralized recording and archiving, and operates either on its own GUI, or can be interfaced with AMX or Crestron control systems.